Hi, I’m Steve and welcome to my website. I have almost 12 years’ experience as a fully qualified driving instructor and have recently returned to the industry. Having enjoyed being an instructor, I had the opportunity in 2008 to teach maths in a further education college. I taught Functional Skills Maths and GCSE Maths to groups of learners who had not achieved GCSE Maths at school. While there was a lot of satisfaction in seeing learners achieve maths success it is bettered by seeing the effect on a learner of passing a driving test at the first attempt. 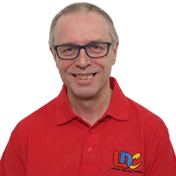 On returning to driving instruction, I have chosen to work with LDC and use the LD System which allows for flexibility in lessons. This means that you learn to drive safely at a rate that suits you. I aim to make every lesson enjoyable and as productive as possible. The LD System helps me to do this more effectively. I have lived in the Gateshead and Newcastle area most of my life and am familiar with the test centres in Gateshead, Elswick and Gosforth. I am happy to offer lessons anywhere in western Newcastle and all parts of Gateshead including Birtley, Blaydon, Ryton, Chopwell and Rowlands Gill. I hope this gives you a brief idea about me so please feel free to click here to "Contact me"